During March 28 and April 15, XTBG hosted its first Field Botany Course. 22 trainees from 13 countries participated in the course. The course was for non-plant taxonomy majors and aimed at arming students with an ability to identify plants in the field, thereby enhancing the quality of observations they may make in the course of their research. Prof. Jim LaFrankie and Prof. 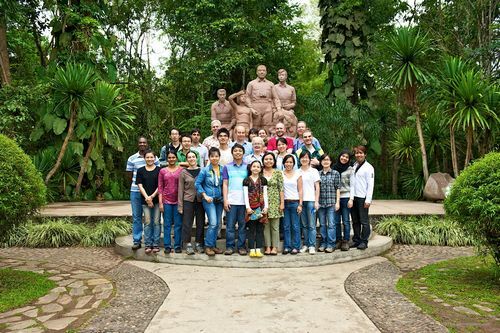 Ferry Slik, two renowned tropical Asia ecologists and botanists were major lecturers for the course. Prof. Jim LaFrankie has over 25 years experience in the region and has probably identified more plant species in the field than anyone. He is author of the authoritative guidebook to the trees of the region – Trees of Tropical Asia. Prof. Ferry Slik is head of Plant Geography at XTBG and an expert on regional plant distribution patterns. Other guest lecturers like Prof. Cao Kunfang, Prof. Tang Yong, Prof. Xu Zengfu, Dr. Fan Zexin, etc from XTBG taught components on their focal taxa or subjects. The participants got a chance to learn the diverse plant species of tropical Southeast Asia. They learnt how to make good quality plant collections, how to describe field characters, and how to recognize the important plant families and genera. During the course, students learned to recognize about 200 plant species in 137 genera, belonging to 43 plant families. Prof. Ferry Slik established a website for the field course, http://xtbg-botany.wikispaces.com/.